Admitting that we are wrong is a difficult lesson to learn. Taking a moment to own up to your mistake is the first and most important step but also probably the most challenging. Something to think about to make it a bit easier is the positive outcomes. There really are no mistakes in life, only opportunities to creatively solve problems and to learn. We all are all going to be wrong about something, but stopping and learning is a huge advantage. Take your wisdom with you to your next opportunity. The chance for reconciliation is the other positive. While there isn’t always room for reconciliation, it is almost impossible without admitting your fault in the first place. Focus on these positive consequences rather than the negatives and it becomes easier to face the music. There is always an easy way and a correct way and the correct way is always the better choice. Owning up to your wrongs is the correct way but this also gives you power over your wrongs. This requires strength and is a major self esteem booster. Many people struggle to access this strength but we all have it and in this process it is important to remember how you’ve set yourself apart. Confident people make confident decisions and people will recognize this and it is important that you do as well. While it is true that you have very little control over the consequences you’ll face, you are able to control how you respond to them. By admitting you’re wrong, you are essentially putting the ball in someone else’s court. You are upholding your end of a trust bargain and they have to reconcile how they choose to respond. Once you’ve assumed this position, you can accept that you’ve done what you can. Putting yourself in a favorable position is always a good choice as well. For example, if it’s at work, being a good employee or coworker is a great way to have leeway to make mistakes. 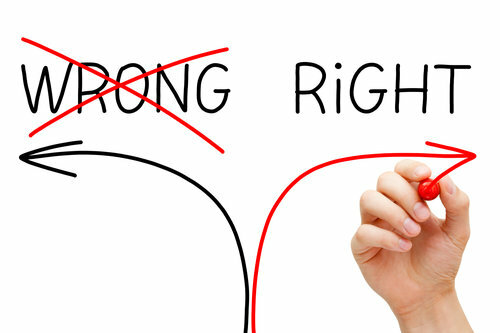 Being wrong about something doesn’t make you as a person wrong. Low self-esteem will cause you to reinforce your beliefs about yourself which leads to guarding against being wrong, even to ourselves. There is always a chance to show your quality and remember, every human ever has made a mistake, so you’re not alone. You probably even have someone in your life who has wronged you that has remained in good standing despite their mistakes. If you’re capable of this empathy, other people are as well. You can’t right every wrong in the eyes of another person, but you can always make it right with yourself. If you upset someone in the workplace, ask them what you can do to not make the same mistake in the future. Learn your boundaries with that person and respect them. If you gave a poor performance at something, be it a test or a work project or something else, either do better next time, or find a way to redo it and fix the mistakes. Don’t be afraid to ask someone how you can make it right either. In the end, finding peace with your wrongs is the best way to make it right for everyone involved, including yourself. Admitting that we are wrong is a difficult lesson to learn. For some people, it comes a bit more naturally but all of us have to go through the process. Practice is the only way to get better so make sure to fit these tips into your routine and eventually you’ll reap the rewards of your efforts. You’ll see your relationships improve, better career performance and much higher self-esteem and there is very little that is more invaluable.